The majority of recently arrived Ukrainian citizens have not spoken to the Russian authorities about obtaining official refugee status. A number of them are living in temporary camps located in neighbouring regions. Russia’s United Nations High Commissioner for Refugees confirmed Federal Migration Service (FMS) data indicating that around half a million Ukrainian citizens have fled from the conflict in the Donetsk and Luhansk regions of eastern Ukraine to Russia. The data cited by the UN’s Russia office is consistent with the FMS data, according to the Russian spokeswoman for the United Nations High Commissioner for Refugees, Galina Negrustuyeva. “Our staff members travelled to the border areas. We have seen everything with our own eyes, and we have no reason not to trust the information provided by the Russian Migration Service,” Negrustuyeva confirmed RIR the data of the Federal Migration Service. According to the UN report of July 7, about 1.8 million Ukrainian citizens are currently residing in Russia. Of these, about 480,000 have recently arrived from combat zones. The majority of recently arrived Ukrainian citizens have not yet approached the FMS about obtaining official refugee status. A number of Ukrainians are living in temporary camps located in neighbouring regions. Others have gone to live with friends and relatives who reside in Russia. “There are currently 414,726 people located in Russian border territories, and 20,461 people have already applied for temporary shelter. These numbers will grow, and there will be changes to the statuses the residents have obtained,” said Deputy Director of the FMS Anatoly Kuznetsov on Monday during a hearing at the Public Chamber of the Russian Federation. Ukrainian citizens are free to stay in Russia for a period of 90 days. After this, they need to either return home or obtain the necessary residence permits through the FMS. 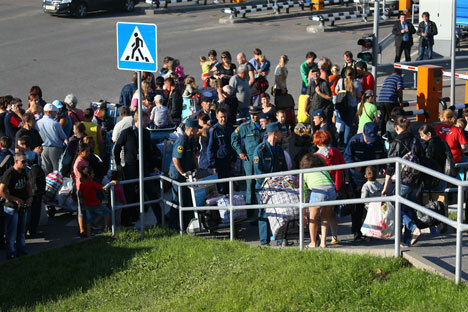 As Kuznetsov noted, the State Program to Assist Voluntary Resettlement of Compatriots Living Abroad is in popular demand. This is an initiative that allows those “brought up in the traditions of Russian culture and who speak the Russian language” to voluntarily apply to be resettled in the Russian Federation. The statement issued by the authorities states that Ukrainian citizens are being received in dozens of regions in Russia. Some of these regions have declared a state of emergency due to the large influx of refugees. According to information provided by the FMS, over 300 temporary shelter locations have opened in order to accommodate Ukrainian citizens. At the same time, the director of independent non-profit organization Moscow Bureau for Human Rights, Alexander Brod, noted that only 1,300 people have submitted official requests to obtain refugee status. According to him, such a low rate is due to a low level of legal awareness among the citizens crossing the border. “It is easier to obtain refugee status now; the process takes three months. The procedure has been simplified specifically for those who are arriving from the conflict zone. Refugee status allows people to receive benefits, access to social services, and obtain a work permit. Refugee status is issued for one year and may be extended after the documents expire,” said Brod. He added that people can work at the mobile employment services that operate in the border regions while they are waiting for their application to be approved. “Refugees can obtain employment in the service sector very quickly as chefs and kitchen staff. Construction workers are also in demand. Salary figures for these types of jobs for Ukrainian citizens are no different from those for local residents and can reach up to 40,000 roubles [$1,170] per month,” employment service representative Zhanna Denkinsana said. The head of the Russian presidential administration Sergei Ivanov said, refugees from Ukraine who decide to stay in Russia will be able to count on targeted financial assistance in the near future. He indicated that the State Program to Assist Voluntary Resettlement of Compatriots Living Abroad is to include the Rostov Region, which borders Ukraine, and the nearby Stavropol Territory. This text was updated on July 10 at 2 pm to correct the statement by the UNHCR representative. The representative did not give a number, as previously stated, but confirmed the numbers given by Russia's Federal Migration Service.